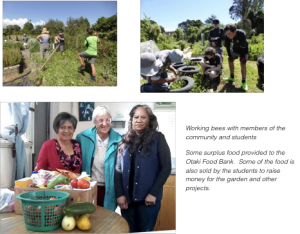 Discussions with Ōtaki College identified that the College had one of the few college horticulture blocks remaining in the country and that the College was keen to see it and the associated curriculum developed. A small community garden was in place but it was struggling. Energise Ōtaki was keen to support a community/ College based initiative, given the wider links to food and energy issues. We obtained funding in 2016 as part of the Unlocking Curious Minds Fund to start the process of linking initiatives at the block with a hands-on project based curriculum, working with a range of community groups and people. In 2017 the Working Better Together Fund provided funding to allow this to be further developed.